Liam Peters must spend his summer vacation taking care of his lame great-grandmother, and for an almost-sixteen-year-old, it's the worst injustice he could imagine. Victoria Hennessy grew up in rural Colorado but is excited to spend a few months in the city as she prepares for college. When the end of the world arrives, both teens head for home. Chance puts them together at the heart of a dying metropolis. The zombie apocalypse is the last place anyone should look for love, but Liam sees something in the pretty coed that is both a distraction and a motivator as they struggle to stay alive. Somewhere along the way, he realizes he has two women he'd die to save. But Victoria is no damsel in distress, nor is the ever-feisty Grandma Marty. The trio is swept up in the action to escape the zombie outbreak, but can two teens and an elderly woman survive criminal encounters, panicked citizens, and a military running out of options? And do it as mutating zombies press in from all sides? 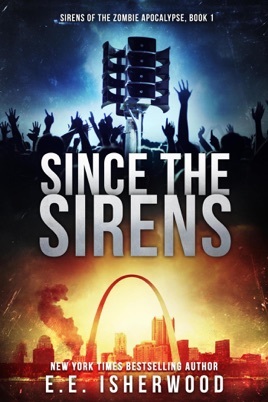 Since the Sirens is the gripping first installment of E. E. Isherwood's hit post-apocalyptic series Sirens of the Zombie Apocalypse. If you like zombie novels with ongoing societal collapse, zombie hordes always bearing down on the heroes, a little conspiracy, and skin-of-teeth escapes, you won't be able to put down this awesome read! "Love this series. Can't wait to read more! A truly unique take on end of the world themes." "This was the first book where after I finished reading it, I went on Facebook and started following the author and even messaged the author." "Echoes of King's "The Stand" vaguely coming through but in no way ripping off any story lines." "Not a big fan of zombie books, but the author is such a good storyteller I got sucked right into it." "From "Slow Burn" to "Whiskey Tango Foxtrot", this novel sets a mood of action, distinct imagery and likable characters." Collectively, all six books combine to over 400 4+ star ratings. Here are some reviews from book 6, so you know this isn't a trap! "I can't wait until the next book comes out I'm obsessed with this series! This was the best one yet." "Loved this series!!!!! If you are a fan of end of the world as we know it scenarios, buy this! Can't wait for more of his books!!!" "OMG! You have got to be kidding me! I have to wait for the next book? I might go crazy waiting for the next one!"